Jill Byrne smiles as her turf course burns. Photo by Nick Hahn. Virginia Cavalier basketball. Tiger Woods. Just last night in the NHL Playoffs, the lowest-seed Columbus Blue Jackets took out the highest-seed Tampa Bay Lightning….in a four game sweep. Are there any doubts that 2019 is the year of the comeback? And now comes Colonial Downs. The official lighting of the torch of the countdown to Colonial Downs began Tuesday evening with its famous turf burn. With the assistance of the New Kent County Fire department and Southern States, the controlled burn pretty much followed the path of the Virginia Derby, igniting at the top of the stretch, passing the grandstand and finishing up into a slow-moving backburn. “It takes up the dead leaf and burns up the thatch that’s underneath and all the nutrients that we put on the year before that’s in the leaf of the plant,” explained J. D. Thomas, the longtime maestro of the fury. In previous years Thomas would need to hustle the burn and following grass leaf growth in order to have the turf course prepared by the first of June, the traditional start of Colonial’s meet. Now with an August start date, he gets two extra months of growth in the warm season. Walking on the preburn green turf of the course, under your feet, it nearly felt ready to host racing then. “The hotter it is, the better the Bermuda likes it. The turf will be the best it’s ever been. We almost questioned not burning, it was so green. The best way to get Bermuda to grow is to piss it off,” joked Thomas. Another innovative measure Thomas performs is an application of crumb rubber into the profile, although that practice may be sunsetting. Thomas will cut a few cores in the fall and look at the ratio to rubber to see if the course has had enough. 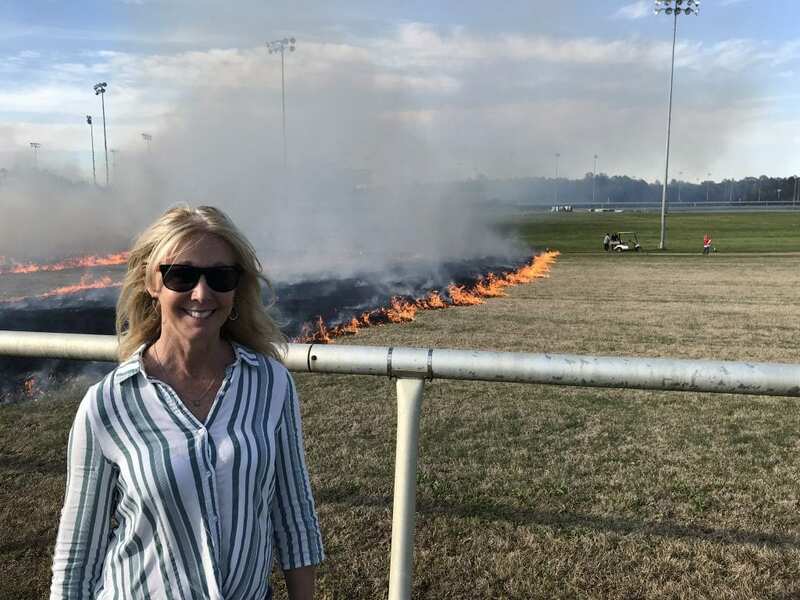 While the turf burn has become a spring tradition in New Kent, witnessing the burn for the first time was Colonial’s newest vice-president of racing operations, the aptly-named Jill Byrne (pronounced Burn). With the ceremonial burning of the old leaf leading to the germination of the new leaf symbolizing the rebirth of Virginia racing, optimism — as well as smoke — was in the air. “It’s something good for the industry. 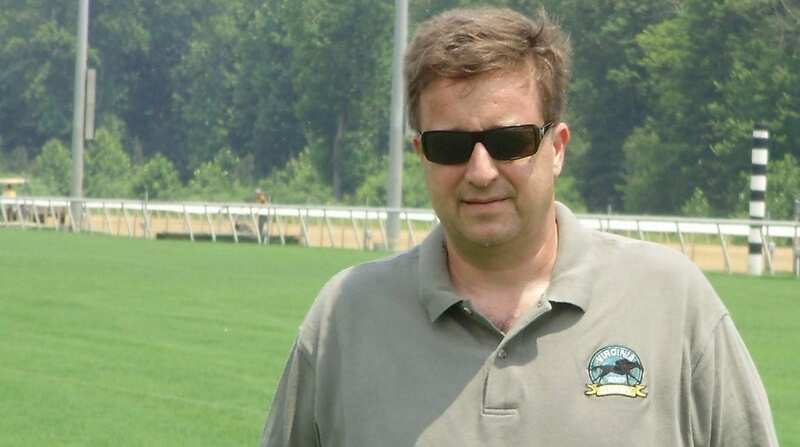 When a racetrack is coming back to life instead of going away, how great and positive is that news for the entire horse racing industry?” expressed Byrne. While Byrne had previously watched races at Colonial Downs as part of her work at TVG, it had been some time since she’d been back prior to her hiring. The University of Virginia graduate, like many race fans, was watching from afar. Having a rustic setting, Colonial Downs nearly always looked great on television. With the turf so prominent in the condition book, Byrne has had to field questions about whether Colonial has a dirt course. It does, a mile-and-a-quarter course that has also seen its share of high-quality racing. In Virginia, the track’s absence — its August 8 opening day will be more than six years after its last live Thoroughbred card, on July 13, 2013, when War Dancer won the Virginia Derby — has served as a long walk through the desert seeking sites in other localities, new track owners and operators, and the addition of historic horse racing terminals that await patrons when Rosie’s at Colonial Downs opens April 23. The old song says that “you don’t know what you’ve got ’til it’s gone,” and that certainly applies to Colonial Downs. Now Colonial is back and, officials and horsemen hope, set to join its Bermuda grass turf course in rising from the ashes.